Fri., June 22, 2018, 10:26 p.m.
PASCO – Olivier Basabe reached via error then scored the go-ahead run on a sacrifice fly in the seventh inning and the Tri-City Dust Devils topped the Spokane Indians 5-3 in Northwest League play at Gesa Stadium on Friday. Second baseman Cristian Inoa booted a routine ground ball by Basabe, then reliever Royce Bolinger stumbled during his delivery and was called for a balk to move the runner up to second. Bolinger then hit catcher Chandler Seagle with a 1-1 pitch. With one down and runners at the corners, Aledemar Burgos flied to medium center and Basabe beat the throw home by J.P. Martinez and the Indians trailed 4-3. Tri-City added an insurance run in the eighth. Bolinger (0-3) mishandled a comebacker, then threw it away. A pair of singles loaded the bases and Bolinger hit Basabe to force in a run. The Indians went quietly in the ninth. Spokane starter Jake Latz turned in a strong outing. The 22-year-old lefty went 5 2/3 innings and struck out nine. He allowed three earned runs on four hits and a walk. The Indians went right to work on Tri-City starter Adrian Martinez. 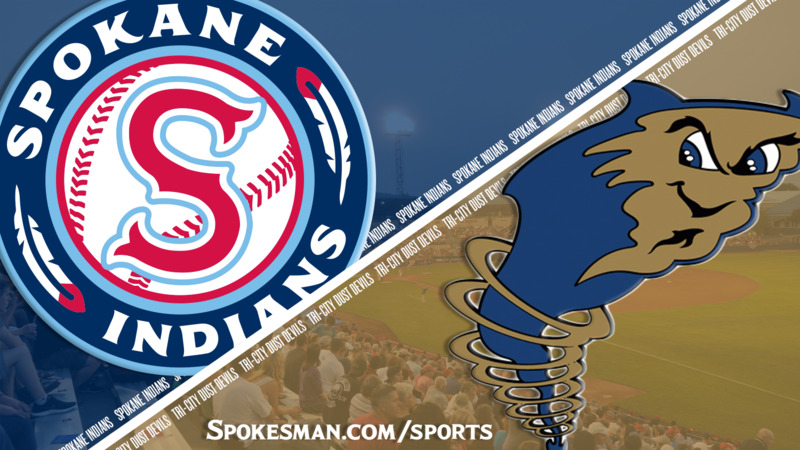 Spokane’s leadoff hitter Martinez laced a an 0-2 pitch into the right-field corner and the speedy outfielder scored on Jonah McReynolds’ line drive single to center. Miguel Aparicio grounded out for the first out of the inning but McReynolds moved up to second on the play. Curtis Terry, who entered play tied for the league lead in homers (3) and RBIs (8), struck out but Starling Joseph ripped a liner to left field to plate McReynolds. Joseph moved up to second on a fielding error by Michael Curry but Cristian Inoa was caught looking to end the first-inning rally. Latz cruised through the first three innings. The Texas Rangers’ fifth round pick of the 2017 MLB Draft struck out two in the first, two more in the second and another in the third, while allowing two base hits and no walks. The Indians added a run in the fourth without the benefit of a base hit. Joseph was hit by a pitch leading off the frame. A wild pitch moved him up to second. With one down, another wild pitch put Joseph at third and Hasuan Viera walked. Isaias Quiroz then lofted a fly ball to left deep enough to plate Joseph. The rally stalled when Viera was caught stealing. Tri-City (5-3) got to Latz in the home half of the fourth. With one down, Owen Miller singled on a soft line drive and went to second on a wild pitch. Latz left a fastball in the middle of the plate and Blake Hunt drilled a single to center to drive in Miller. With one down in the Indians’ fifth, Martinez walked and McReynolds skied one to right that no one could reach for a single. But Aparicio and Terry both popped out and the rally fizzled. Latz got into hot water in the sixth as Tre Carter walked and Miller singled with one out. Latz got Luis Asuncion to fly out to the track in right and both runners moved up. That did it for Latz, as manager Kenny Holmberg lifted him in place of righty Royce Bolinger. Bolinger walked Hunt to load the bases, then Michael Curry lined a two-run single to right tie it. Curry was thrown out trying for a double by Joseph, but the damage was done. In the top of the seventh with two down, Martinez doubled when the Tri-City defense couldn’t find a fly ball in the dusk sky, but McReynolds struck out looking on a curveball to end the inning. Spokane got something going in the eighth as Aparicio led off with a single and Terry doubled to right. Joseph and Inoa both struck out swinging. Diosbel Arias pinch-hit for Viera and was walked intentionally to face Quiroz. But reliever Gabe Mosser struck out Quiroz on a foul tip to end the threat. Published: June 22, 2018, 10:26 p.m.